'Untitled painting' was created during a spectacularly successful year when Whiteley exhibited to great acclaim at London's Whitechapel Gallery and, following the purchase of a painting by the Tate Gallery, established his international reputation. 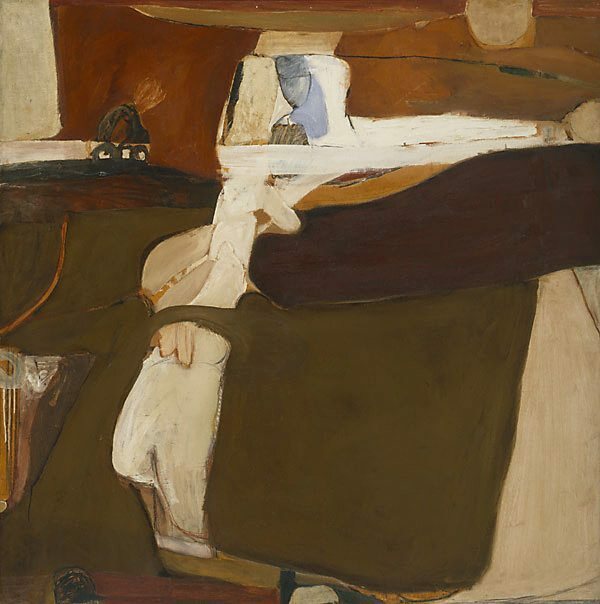 During his time in London, Whiteley continued to combine the earthy colours of Australia - reflecting the influence of the paintings of Russell Drysdale - and the ambience of Italian painting and architecture with powerful hybrid forms of landscape and the female torso. 'Untitled painting' exudes the confidence with which he handled his visual sources, heralding the elegant and relaxed abstract work of his subsequent honeymoon period at Sigean in the south of France. Signed and dated u.r. verso, black oil "Brett Whiteley 61".